How Does the Captcha Plugin Work? It is a wide spread solution to keep forms spam free using a graphical captcha containing some text that a user has to enter. A human who fills out a form will need some time to read the texts and type in the information. Bots, however, fill out forms in nearly no time. With Aimy Captcha-Less Form Guard you can set a minimum time required to fill out the form: If the form is submitted faster than that, the submission will be rejected. The bot trap works with a hidden input field in the form. Bots usually fill out all fields present in the form's code and do not evaluate which ones are actually rendered by the browser and thus shown to a human visitor. By placing such a hidden input field in your form, Aimy Captcha-Less Form Guard can easily deny every submission that contains data for this special field. A lot of organizations put a lot of effort in building up blacklists, where known spam hosts are listed. Aimy Extensions uses two of those databases to look up spam-likely IP-addresses: NiX Spam and SORBS (safe). If the form is filled out by a bot that is on one of those lists, form submission will be rejected to keep your website secure. 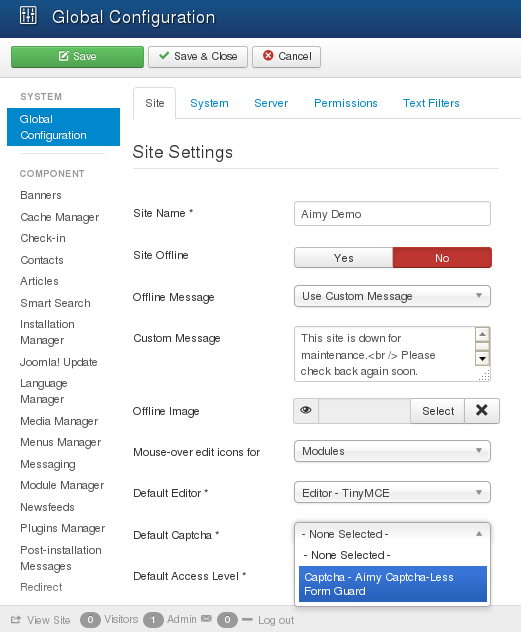 In the plugin configuration you can activate one or all methods to protect your forms. 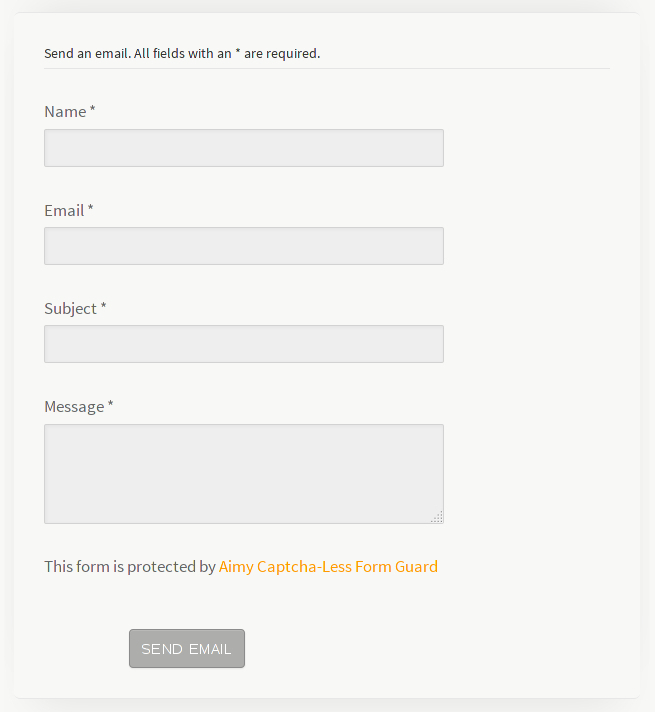 Aimy Captcha-Less Form Guard is a Joomla! system plugin that allows you to protect your forms from spambots - without requiring an image based Captcha. This manual documents both the free and the pro version of the Joomla! extension. Any documentation that applies to one of the versions only is marked either (FREE) or (PRO) respectively. From the menu, choose "Extensions" → "Extensions Manager"
For further information, please have a look at the Joomla! documentation: Installing an Extension. NOTE: All plugins are disabled by Joomla! when installed for the first time. To enable Aimy Captcha-Less Form Guard, proceed and configure the plugin. At any time, you can configure the Aimy Captcha-Less Form Guard plugin using Joomla! 's Plugin Manager by choosing "Extensions" → "Plugin Manager" from the menu. Locate the plugin and click on its name in the "Plugin Name" column of the plugin listing. In order to use Aimy Captcha-Less Form Guard functionality, you have to enable it first. Aimy Captcha-Less Form Guard provides a couple of methods to guard Joomla! forms against spam without requiring a traditional image-based Captcha. NOTE: You may choose any combination of the available protection mechanisms - but at least one protection mechanism has to be enabled. Unlike humans, spambots usually require nearly no time to fill out your forms. They obtain your form, fill in their data and submit it immediately. Any human would at least have needed a few seconds to understand what data to enter where in your form and actually fill it in before clicking the submit button. This distinction is why setting a minimum fill out time helps to programmatically distinguish spambots from humans. If this protection method is enabled, Aimy Captcha-Less Form Guard keeps track of the time the form has been sent to the user and only accepts it if a certain amount of time has passed on submission. To enable this feature, set "Minimum Fill Out Time" to "On" and optionally select a "Minimum Time (in seconds)" that suits your form best or stick to the default of seven (7) seconds. Spambots are usually not very smart guys. They obtain your form's code, gather its fields and submit their data as long as the form has either been accepted or a certain amount of attempts failed. They don't have an understanding of what input the fields of your form actually expect and they don't look at the rendered form like a human user would - they just evaluate your form's code. Aimy Captcha-Less Form Guard therefore provides an effective bot trap that helps to detect whether a form has been submitted by man or machine: a special field is placed in your form that is not shown to your human users. Technically it is hidden using CSS so a browser won't render it while it is still there in the form's code. If this protection method is enabled, Aimy Captcha-Less Form Guard checks whether the special field has been filled out and rejects the form submission if any data has been sent for this field. To enable this feature, set "Bot Trap" to "On". Some nice and smart people do take a huge effort to identify machines on the internet that send spam and make their knowledge available to the public. Aimy Captcha-Less Form Guard allows you to use these blacklists to automatically check the IP address of anyone trying to submit your form. If the sender's address is known to send spam by any of the activated DNSBL providers, the form submission will be rejected. To enable logging of rejected form submissions, set "Logging" to "On". 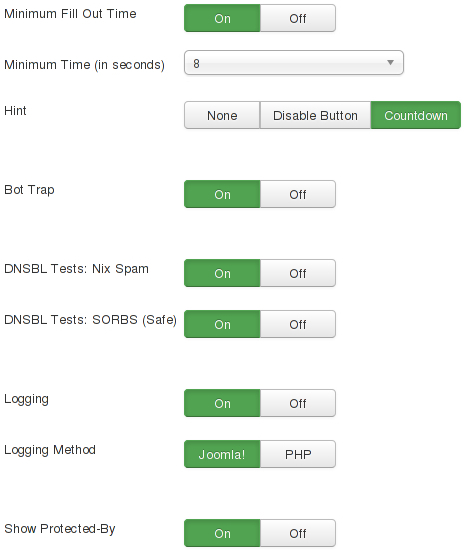 If selected, logging is done using Joomla! 's logging facilities. The log file will be named "aimycaptchalessformguard.php" and stored in the log folder set up in Joomla! 's "Global Configuration" ("System" tab). If selected, logging is done using PHP's standard error logging facility using the function error_log(). As a result, all logged messages are stored along with your other PHP error messages. If you enabled the "Minimum Fill Out Time" protection mechanism, you may want to give your users a hint about it. This further reduces the likeliness of a false-positive bot detection. If selected, the submit button of the form will be disabled until the configured minimum time is over. If selected, the submit button will be temporary disabled and its text will be replaced by a countdown that is refreshed each second, as long as the minimum time is met. The initial text will be restored afterwards. To put this extension to use, tell Joomla! to do so: Beneath System → Global Configuration set "Default Captcha" to Aimy Captcha-Less Form Guard. To inform your users that the form they are filling out is protected, Aimy Captcha-Less Form Guard displays a short message saying: "This form is protected by Aimy Captcha-Less Form Guard". This way your users won't misinterpret the lack of a traditional, image-based captcha as your site being unprotected and insecure. In contrast, they may very well appreciate not being forced to enter some hard to read code to prove being a human while still being aware of your security measures. This helps you building trust. However, if you do like to replace the default message shown, you do not have to edit any source code. Just use Joomla! 's default mechanism of Language Overrides, and override the constant AIMY_CLFG_PROTECTED_MSG_FMT with your new message. To switch the message off completely, set "Show Protected-By" to "Off" (PRO). Aimy Captcha-Less Form Guard uses our new versioning scheme and introduces a French translation. If you order updates for more than one domain at once, the additional domains get discounts from 25% up to 50%! 3 months of updates for free! Just place your order like before - the renewal on your domain will be detected automatically. For legal reasons we sell our software to countries of the European Union only. All prices are final prices including VAT of your country, which is initially determined by your IPv4 address. If necessary, you can change your country during checkout. Please note that the VAT may change in this case too. You can pay with PayPal or bank transfer, both at no additional costs. All Aimy Extensions' PRO versions are provided for download, so there will be no shipping costs.